Thank you for your interest in and welcome to the Chelsea Rod and Gun Club! “Pineview” is a clubhouse and grounds that all CRG Club members can be proud of and enjoy year round. Amenities include a full kitchen, bathrooms, fireplace, bar and meeting rooms. The property includes a trap range, rifle and pistol ranges (50, 100, and 200-yards), archery 3-D walk-through range, practice ranges, and various nature trails throughout the property. The clubhouse and property is open to the public only during our scheduled events. To participate, and inform others, in the protection of natural resources including air, surface waters, aquifers, soil, minerals, plant life, wild and domestic animals, and other living creatures. To develop transferable skills in the sportsmanlike, legal harvesting of surplus game animals, game birds and game fish while sharing in the protection of endangered species. To maintain an ongoing program of instruction to all age-qualified persons in the safe, responsible management of firearms, outdoors and at home, with the help of club instructors certified by the Michigan Department of Natural Resources. To provide a special encouragement to youth for the safe enjoyment of the outdoors, and ongoing concern for the protection of natural resources. 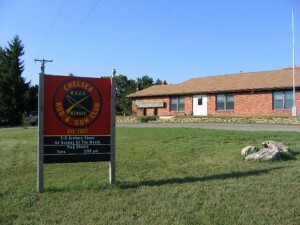 The Chelsea Rod and Gun Club is and always has been an active and responsible member of the community since the inception of the club in 1936. Today, it continues in this tradition by supporting local educational programs and, on a wider scope, the environmental and conservation community at large. The charter of the club reflects the commitment to participate and inform others in efforts to protect the environment and conserve our natural resources. CRGC is a charter member of the Michigan United Conservation Clubs attesting to this longstanding commitment to public service in conservation. In the context of the outdoor sports, the club is dedicated to educating hunters, young and old alike, in the Hunter Education courses necessary to assure the ethical pursuit of game and responsible public conduct. The contribution of hunters to the nations parks and wildlife resources is historic and CRGC is proud to be associated with this legacy.